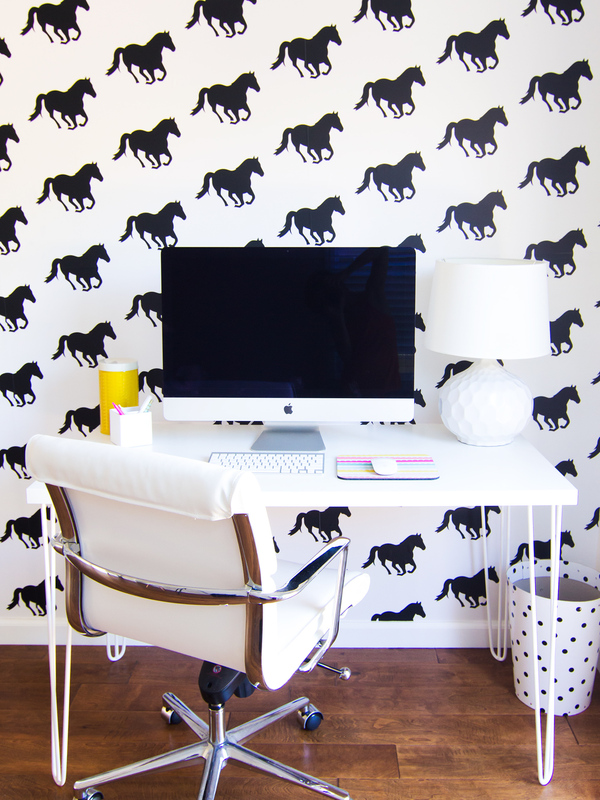 Yesterday I shared details about new office and today I’m sharing all about my horse wallpaper. Maybe it’s the 10 year old girl in me (because that’s when my love of horses really started), but I’m just so smitten by it. 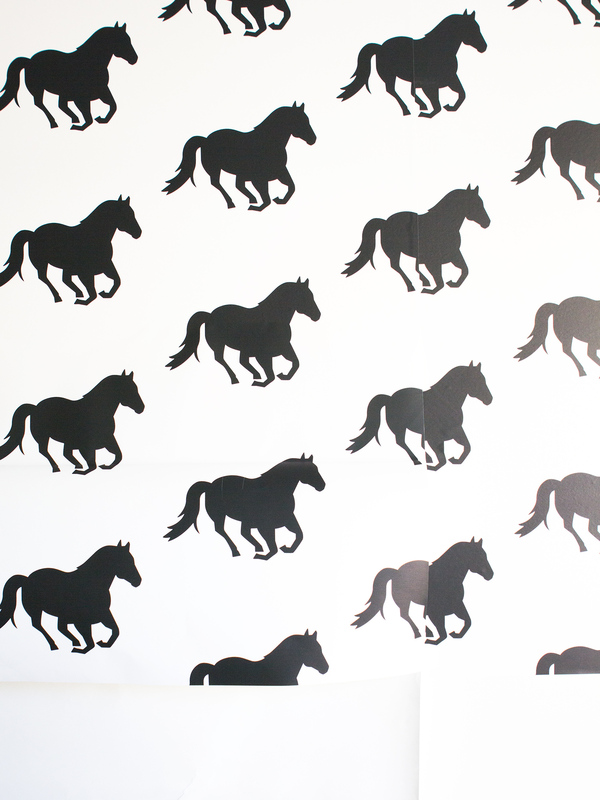 I think every horse person needs a wall covered in a horse print. I like to think of it as horse crazy chic. After chatting with my friend PJ about shelving a few weeks, I had my heart set on creating a horse pattern and wallpapering the wall behind my office shelving. Since we’re renting our home, I couldn’t commit to real wallpaper or paint. So I was really excited to learn about Snapbox’s peel & stick fabric posters. They are a peel and stick woven material that can be titled to create a repeat pattern and can be removed. No glue or water need. Just what I was looking for! Here’s what it looked like before the shelving was installed. I decided to use my horse print that I created for my phone cases. 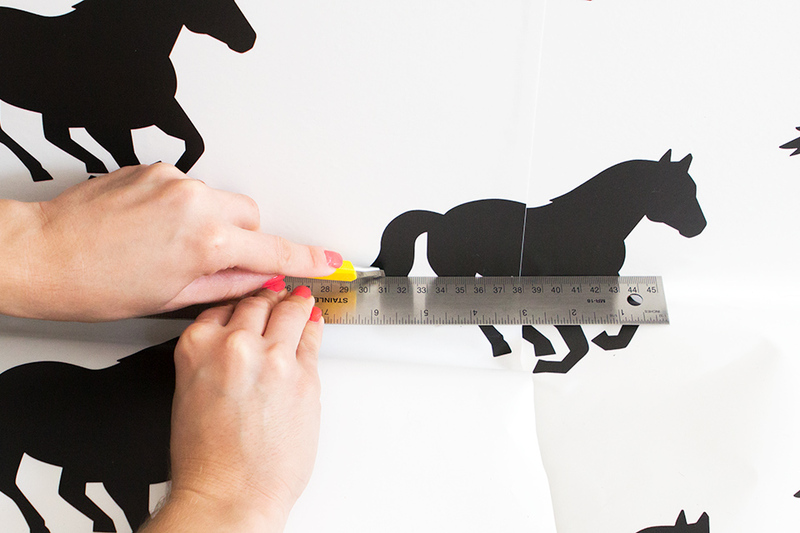 I just scaled the pattern so each horse is about 8″ wide. Then I titled the pattern so it fit within the largest print size available, which is 36″ x 54″. We hung the wall stickers before the Elfa shelving was installed. And let me share this full disclaimer: hanging wallpaper (especially repeat patterns) will abolsutely test your relationship with your signigant other. If you thought Ikea really tested you, I will say, hanging wallpaper is not for the faint at heart. But it’s super helpful to have an extra set of hands while you’re installing the stickers so don’t go at this alone. Ok, now my second disclaimer, though lining up the pattern can be a bit tricky at times, I found this entire process to be significantly easier than hanging real wallpaper. And if you’re a bit intimidated by the thought of tackling such a big project, I recommend starting with just a small section, like the wall space behind a headboard or a desk. Work from the ceiling down. Start in one upper corner and work across. Then add the bottom row, beginning below the first sticker. Align the first sticker so the pattern is straight up and down. Most ceilings and walls, including mine, are not perfectly level. To accommodate the changes in the wall, leave a few inches of extra wallpaper on the ceiling and in the corner. Peel back about 6″ of the paper backing at a time. Work from the middle outward, smoothing out the wallpaper with your hands. Peel 6″ more and repeat step 3 until the sticker is completely applied. Use a squeegee to gently smooth out any air bubbles. Sometime you’ll get bubble that can’t be fixed with the squeegee, when this happens, carefully life up the sticker at a 45° angle and use your hands to smooth it down as you reapply it. As you apply the stickers from one side of the wall to the other, use the ceiling as a guide. I ended up with a huge gap between the top of the wallpaper and the ceiling on the left side, though I was able to slice in another piece and hide my mistake, this could have been avoided if I used a level to ensure that the pattern was perfectly straight up and down on the wall. So please learn from my mistakes! Once you’re done applying the wallpaper, use the squeegee to make sure it’s firm adheres to all the corners and near the baseboards. Line up your ruler along the edge and use the utility knife to trim off the excess sticker. 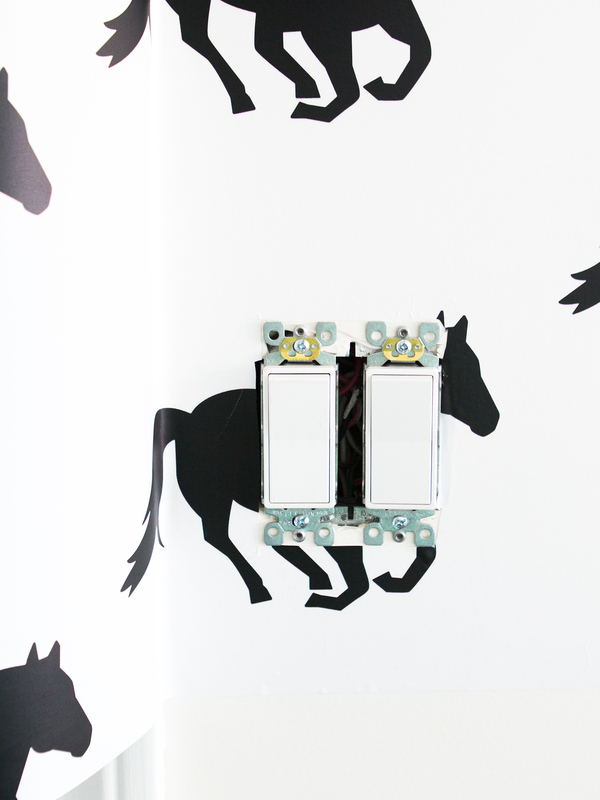 If you have outlets or light switches on the wall, remove the faceplates before hanging the wallpaper. Just use the utility knife to carefully cut around them and then use squeegee to remove any air bubbles. Gorgeous! This process seems much easier than the paste method I tried! Love this! Where did you get your chair and the gold lights? 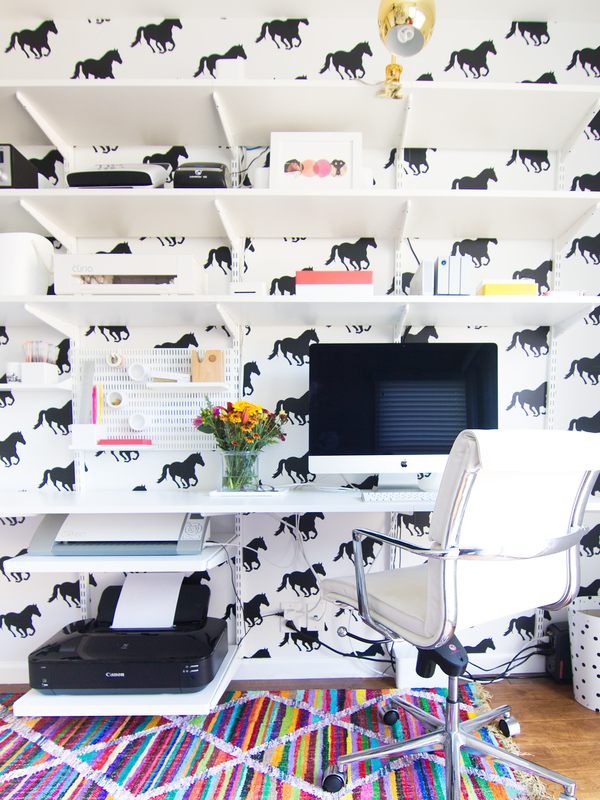 Sarah, you are gonna laugh because I have been dreaming of a horse-covered workspace feature wall! Great horsey minds, amirite? LOVE this, so gorgeous and you broke the how-to down so well! Really gorgeous Sarah! I just love it, and I love that it is so you! Such a fun use for SnapBox’s peel and stick posters. Seriously, this is so amazing. Honestly, this is amazing! I love your disclaimers, too… I know without a doubt I could NOT do with my husband, haha. I am headed over to SnapBox now to see what other great products they have! This is just so so good. And horses? Perfect!